Momo and I behaved like little kids for the last few months, we were faithfully collecting spare coins to put into each of our piggy bank. When it finally reached $318 each for our piggy bank, we broke it! We carried the heavy bag of coins to Universal Studios Singapore (USS) and told the lady at the ticket counter: "Please, can we have 2 Annual Pass, the Fun Pass version." Did we really do that? No, we just took out our iPhone launched the calculator and enter $318 divided by $72 (weekend ticket) and we saw that we just needed to visit Universal Studios 4.4 times to make it worth it. Instead of a bagful of heavy coins, we gave the counter lady a plastic card to purchase 2 plastic cards today! We are both glad and a little dissapointed when we got the card. We are happy because we are proud owner of the Fun Pass annual pass. Disappointed because there was no Universal Studios logo on the card! 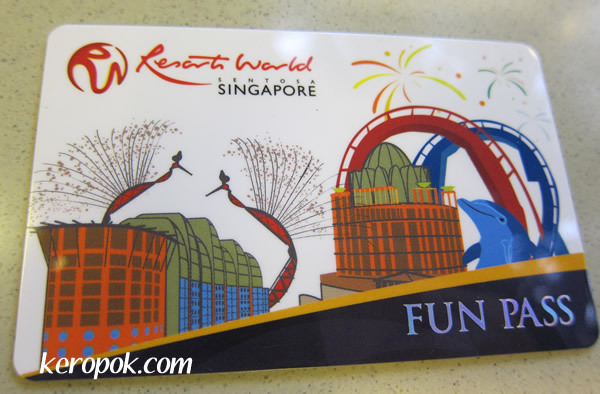 There was only a Resorts World Sentosa Singapore logo and words on the card. The only indication that it's the Universal Studios Singapore card is at the back of the card. I have blanked out the original Name, Barcode and Photo from the card. Why? 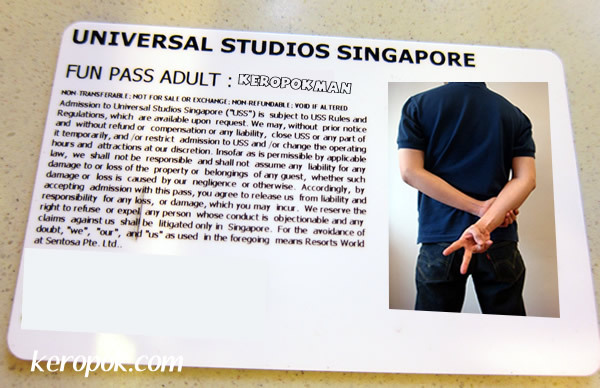 So that you can't print this page out and enter the resort as keropokman! The Fun Pass version does not allow us 365 days access to USS. The other thousand over dollar "Superstar Pass" version does, but we don't think we can afford it. We don't think we will be entering there everyday!